Our staff at Medifocus is committed to keeping our subscribers to the Medifocus Digest Alert on Carcinoid Tumors abreast of the latest new research developments that have recently been published in the medical literature for this condition. In this issue of the Digest Alert, you will find a focused list of hand-picked journal article references that represent the latest advances in basic and clinical research for Carcinoid Tumors. These articles represent the current state-of-the-art of the research that will hopefully lead to additional major advances and breakthroughs in the clinical management of Carcinoid Tumors. You can access the summaries of each article referenced below by simply clicking on the article Title. We will continue to update you with the latest scientific and clinical developments through the Medifocus Digest Alert on Carcinoid Tumors every 3 months. Thank you for your ongoing subscription to this publication. 1: Sclerosing pneumocytoma mixed with a typical carcinoid tumor: A case report and review of literature. Institution: Department of Pathology, the First Hospital and College of Basic Medical Sciences of China Medical University, Shenyang. ; Department of Pathology, General Hospital of Heilongjiang Land Reclamation Bureau, Harbin. ; Department of Pathology, Changyi People's Hospital, Changyi, China. Journal: Medicine (Baltimore). 2019 Feb;98(5):e14315. doi: 10.1097/MD.0000000000014315. 2: Case of Solitary Peritoneal Metastasis From Atypical Bronchopulmonary Carcinoid on 18F-FDG PET/CT. Institution: From the Departments of Nuclear Medicine and PET/CT, and. Journal: Clin Nucl Med. 2019 Mar;44(3):e154-e157. doi: 10.1097/RLU.0000000000002441. 3: Hemolytic Anemia and Gastric Carcinoid in a Russian Seafarer: Highlighting the Role of Diagnostic Technologies in Modern Clinical Practice. Institution: Yale School of Medicine, New Haven, CT.
Journal: Yale J Biol Med. 2018 Sep 21;91(3):243-246. eCollection 2018 Sep.
4: CXCL12 expression is a bona fide predictor of recurrence in lung neuroendocrine tumours; a multicentric study with emphasis on atypical carcinoids - a short report. Institution: Division of Pathology, Fondazione IRCCS Ca' Granda - Ospedale Maggiore Policlinico, University of Milan, Via Francesco Sforza 35, 20122, Milan, Italy. stefano.ferrero@unimi.it. ; Department of Biomedical, Surgical, and Dental Sciences, University of Milan, Milan, Italy. stefano.ferrero@unimi.it. ; School of Medicine, University of Milan, Milan, Italy. ; Department of Thoracic Surgery, Fondazione IRCCS Ca' Granda - Ospedale Maggiore Policlinico, Milan, Italy. ; Department of Medicine and Surgery, University of Milan-Bicocca, Monza, Italy. Journal: Cell Oncol (Dordr). 2018 Dec;41(6):687-691. doi: 10.1007/s13402-018-0401-9. Epub 2018 Sep 4. 5: Atypical carcinoid of the uterine cervix accompanying adenocarcinoma in situ. Institution: Department of Gynecology and Obstetrics, West China Second Hospital, Sichuan University, Chengdu, People's Republic of China. China. (Sichuan University), Ministry of Education, West China Second Hospital, Sichuan University, Chengdu, People's Republic of China. Journal: J Clin Pathol. 2018 Nov;71(11):1030. doi: 10.1136/jclinpath-2018-205081. Epub 2018 Aug 28. 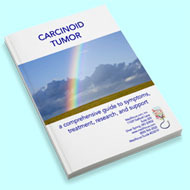 6: Economic analysis of inadequate symptom control in carcinoid syndrome in the United States. Institution: Optum Life Sciences, Health Economics and Outcomes Research, Boston, MA 02215, USA. Journal: Future Oncol. 2018 Oct;14(23):2361-2370. doi: 10.2217/fon-2018-0129. Epub 2018 Aug 10. 7: Exercise cardiac magnetic resonance imaging with pulmonary artery catheter monitoring in carcinoid heart disease: a shift towards early intervention? Institution: Division of Cardiology, University Hospital Leuven, Herestraat 49, 3000, Leuven, Belgium. Belgium. Journal: ESC Heart Fail. 2018 Oct;5(5):953-955. doi: 10.1002/ehf2.12328. Epub 2018 Aug 6. 8: A Rare Case of Ampullary Goblet Cell Carcinoid. Institution: Departments of Gastroenterology, Aichi Cancer Center Hospital, Japan. University School of Medicine, Japan. Hospital, Japan. Japan. Japan. Journal: Intern Med. 2018 Sep 1;57(17):2489-2496. doi: 10.2169/internalmedicine.0516-17. Epub 2018 Mar 30.